Come and bring your friends and neighbors to 25 S Main St, Middleborough for the annual plant sale – which runs from 10:00 a.m. to 3:00 p.m.
We will have the lawn covered with flats of a huge variety of annuals, herbs and vegetables, all grown here in SE Massachusetts for your summer garden and patio pots. (Do try the celery. Last year’s was easy, tender and delicious!) There will also be beautiful hanging baskets in peak condition to brighten your porch or delight your mom or grandmother for Mother’s Day. 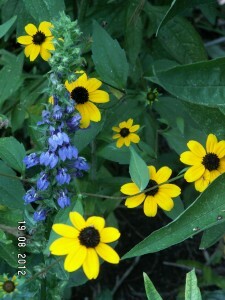 By the Memorial Garden there will be row upon row of perennials for spring, summer and fall, sun or shade. Buy a selection of phlox and beebalm, and you will be guaranteed a month of incredible pinks for summers to come. A mix of woodland wildflowers will bring the joy of discovery to every spring. Our many flowers native to New England will delight your bees and butterflies. We promise to tell you everything we know, including any cautionary tales, about the plants we sell, so come with a notebook as well as cash.